PALM BEACH GARDENS, Fla. - The true perk of playing a Florida golf course that counts a mere 600 millionaires as members becomes apparent about 40 minutes into a round of golf on a sunny afternoon. Shooting over a creek to a narrow opening gives Frenchman's Creek's North Course teeth. There are no groups in front of you and none behind. Your foursome essentially has an entire, perfectly conditioned golf course to itself. Frenchman's Creek member Mark Petricoff grins, noticing that you've noticed. "You could drop a bomb on the golf courses in the afternoon and not hit anybody." That's because at Frenchman's Creek, the members -- who must be residents of this gated luxury golf community north of Palm Beach -- get what they want. When they want it. And most of them want to golf in the morning. "We could set up a system where we staggered tee times throughout the day and made everyone sign up," Frenchman's Creek Executive Director Achal Goswami said. "But we don't want to do that. That's not what we're about here." Play the new North and you can see why the club wants to peel back the curtain and show it off a little. Golf course designer Jim Fazio may reside in the long shadow of his better-known brother Tom, but his redesign here shows why he is becoming the architect of choice for the likes of Donald Trump (for whom Fazio designed the nearby, and much more ostentatious, Trump International Golf Club). You expect the fairways at a place like this to be as green as they are, but the blue of the water can catch you off-guard. Frenchman's Creek's water hazards look like they were lifted from postcards - a rarity at even the most high-end golf courses. The quantity of aqua takes you aback as well. The club gave Fazio free reign with the wet stuff. "We told Fazio that we could really use more water in the community," Petricoff said. "When you tell a golf architect that, you'd better step back and watch out." There's water on 13 holes on the redesigned North Course. It doesn't come in a host of forced carries, but mostly runs along the edges of fairways, ready to snare bad shots. And to play with your head. I watched Goswami sail by it for 17 holes only to get seemingly shaken by the lake that juts in along the dogleg approach on No. 18, all the way to the green. 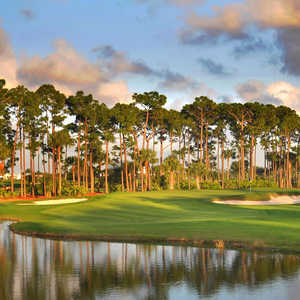 Fazio made the front nine's closer memorable as well, changing it from a par 3 to a par 5 with a huge waterside green. 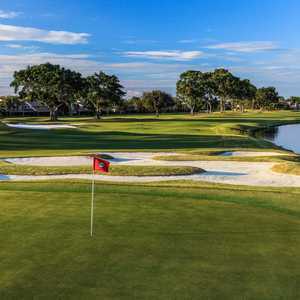 Fazio's most significant change might be the switch to paspalum, a warm-season turf grass that stands up much better to Florida's climate than Bermuda. You can't take perfect greens for granted, even on a multimillionaires' playground. Frenchman's Creek North provides a golf day you're bound to remember, if you can get on -- which isn't quite as impossible as you might think. Even with a community security force that uses thermal-imaging technology to pick out the body heat of anyone who might be hiding in the bushes, the Frenchman's Creek golf courses (there's also a South Course) aren't as sealed-off as Augusta National or Pine Valley. There are regular member-guest tournaments where the guests are treated as well as the members. And if you don't think you can make a Frenchman's member your golf buddy, prospective home buyers stand a pretty good chance of getting a play. 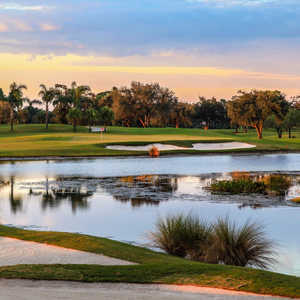 With only about 400 of Frenchman's Creek's 600 homes owned by golfers, and many of those only occupied two to six months a year, there are plenty of times when the North's tee sheet is wide open. And by the sixth tee, staring across a creek at an intimidating par 3 with length (223 yards from the blacks) and a little swerve, it doesn't matter if you're a regular, a potential new resident or a lucky golf writer with an exclusive. You're just happy to be here.